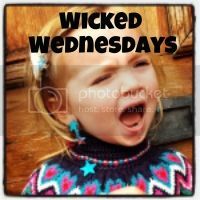 This week my #wickedwednesday post is just a funny toddlerism, the sort of thing I’ve come across umpteen times, and I’m not alone in. The sort of thing that does result in a tantrum! I just found the missing teaspoons. Of course after taking this picture, I tried to put them back in the drawer, which resulted in tears, screams and a sit down protest at horrible mummy. Now I asked her to tidy the spoons and “put them back” and they’ve ended up here! I can’t win can I??!! Thank you! I do wonder what it’ll be too – she definitely keeps me on my toes!! newmummy on Toddler puzzles: Orchard Toys Once Upon A Time puzzle?